Say the word gynecologist to most women and they will want to run away. Yet, those who look after women over the age of 65 should encourage them to get an annual exam. The great news is that the woman may not need a pap smear, which is the part that most women hate about their annual visit the most. 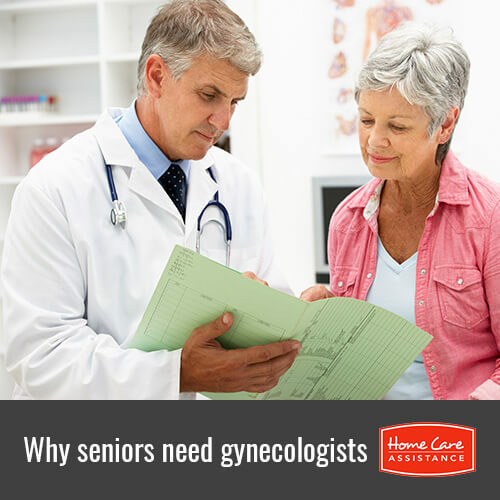 But there are still plenty of reasons why Oshkosh home caregivers should prompt elderly women to see their gynecologists. One reason that a woman needs to see a gynecologist is to discuss changes in bladder and bowel habits. Commonly known as waterworks, many women choose to stay home from fun activities because they fear that they may not be able to get to the restroom in time. Changes in this area of life may be as simple as a urinary tract infection that can be easily treated. These changes, however, can be signs of larger problems that a woman needs to address. During the exam, the doctor may look for signs of cervical cancer. Over 2,000 new cases of cervical cancer are diagnosed in women over the age of 65 each year. If cancer is found, then the woman may work with her doctor to determine the right course of action. Occasionally, the woman may just need to have a hysterectomy. Another important part of the exam might include checking for signs of breast cancer. While the doctor may do a manual breast exam, he or she may recommend that the woman go for a mammogram. Generally, a woman should have a mammogram at least every two years until she reaches the age of 70. Again, only the doctor can recommend what is right in individual circumstances. Oshkosh elderly care providers understand that many women put off these exams over the fear of money. If the woman is covered by private insurance, she may find that the cost of these exams is nearly free depending on the insurance policy. If the woman is on Medicare, then Part B coverage ensures that these exams are almost free. If the woman has no coverage, do not let this stand in her way, as there are many free or affordable solutions available in most cities.